Portable Ghost Detector | OhGizmo! Sure, why not? Who doesn’t need a portable ghost detector? Just attach this cute little thing to your cellphone, or laptop, or wherever else you might fancy dangling a portable ghost detector, and you’ll never be caught unaware next time grandma comes back to ask you why you didn’t hug her one last time. Or something. Point is, this is a real product. Maybe. It’s called the mini-GhostRadar, and is the fruit of a union between SollidAlliance (the ones behind the bigger Ghost Radar) and Strapya, makers of cellphone charms and such. 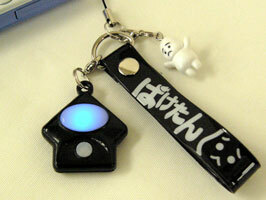 Whenever the device detects a ghost, it lights up. It detects these otherworldly beings by measuring changes in surrounding magnetic waves. Of course, it might just “detect” a random magnet. But, at 2079Yen, or roughly $!8, you’re basically paying for the opportunity to tell people you got a ghost detector dangling from your phone. If you ask me, this is just like those stupid mood rings. But whatever. Oh, did I mention this is Japan only, for now? Well, of course you need a PORTABLE ghost detector. How often are ghosts going to wander by wherever your NON-portable ghost detector is set up? it went off last night at 3AM…not just lights, but kept beeping for hours.